It has always been said that man's best friend is a dog. This is perhaps because they give unconditional love, like a child, to their owner. Even if a person is cruel to their dog, they still seem to love their "master". I have two male dogs and I am constantly amazed at the generous, loving personality of both of these dogs. 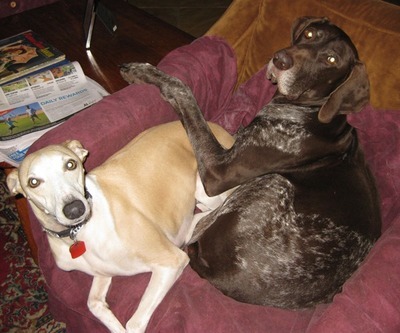 I have written articles about them before, however when I walked in the room and saw the almost blind whippet, lying virtually on top of the German Shorthair Pointer, I was amazed! 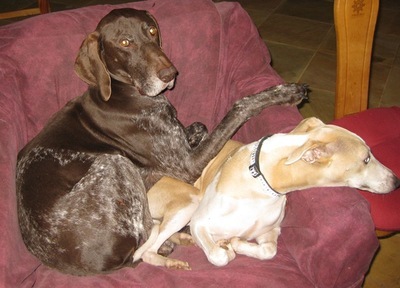 The GSP did not seem to mind - this is a pair of dogs who take food from each others bowls, and the dog who's bowl it is, does not object. I find this a very rare trait in a dog as previously I have had to separate dogs when they are eating as they tend to "have a go at" the dog who tries to pinch their food. 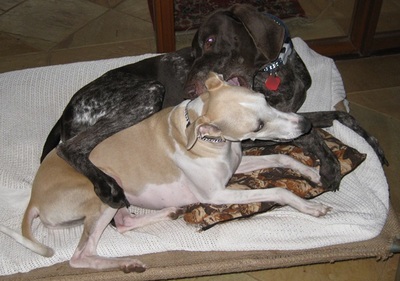 I do not know whether the older dog understands that his young brother has a problem (i.e. almost blind), however I don't think so. 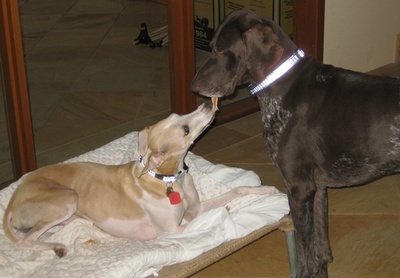 Dash, the whippet is going blind and at night, seems to be totally blind. It is heartbreaking when I lie in bed and I hear these "bangs" as this dog bumps into furniture. Happily, he no longer has as many sores on his legs where he was obviously scraping them outside. 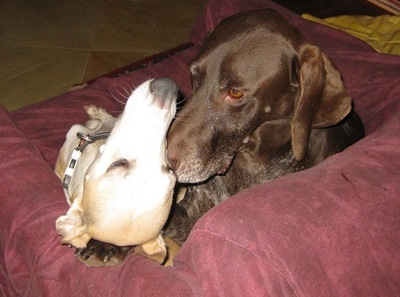 I keep taking photos at the love that seems to exist between these two dogs -or is it my imagination? I find that males, oddly enough, seem to get on better when living together. Perhaps it is because they understand the pecking order in the household. I have been accused of treating the dogs like children and have even received an email from one of my sons attaching a letter from a person who's mother treats her dogs better than she did the children -has more patience, and plays with them more -I am guilty as charged as there is something about a faithful dog that I just cannot resist! When it is cold, they snuggle up together on the one bed. When Pinno was younger, they used to play together a lot. Dogs are such wonderful pets, and I do not know how I could live without one or two. What can you do if your dog is diagnosed as going blind? Do you ever get up in the morning feeling just as tired as when you went to bed? Do you mix blues and greens in the clothes you wear? Can you imagine living in this street, and having to give your address -would it turn you off buying?